I started making rosaries specifically because I wanted to have quality rosaries for my family. I enjoyed making rosaries so much, that I soon started my Graceful Rosaries website. , the same standards of quality that I would expect for my own personal use, I wanted to provide for my customers. But what is the best quality rosary for each person? There is no one answer to that question, different budgets will dictate the quality of the materials chosen....but it is worth considering factors like strength, cost, and beauty that will fit into every price range. Understanding the various types of rosary construction is a good way to understand the difference between rosaries. Here are a list of the most common rosaries available: 1. Cord Rosaries, 2. Chain Rosaries 3) Wire Wrapped Rosaries 4) Beaded Rosaries. 1. Cord Rosaries: In lab testing parachute cord #36 twine is the strongest cord available, breaking at 550 lbs of tensile strength. But this cord is too thick to make a beaded rosary. So it would have to be a knotted cord rosary. The #9 twine used in wooden cord rosaries holds up well to tugs and pulls. Many rosary makes swear by these for longevity of their cord rosary. I have not seen lab testing on the #9 cord. But I have read many people love their wood and cord rosary for strength and practicality on the Rosary Forums I have read. __2. Chain Rosaries -Solid Wire Strength: The strongest metal that is used in rosary making is Stainless steel wire. (picture on the left) It is stronger than Sterling Silver, Gold, Bronze and Brass. The 21 gauge stainless steel wire is a very strong wire appropriate for rosary making. It is a good size to fit into the average bead, yet it resists bending. This is a great thing for the finished rosary, since it is highly unlikely to be misshaped even if you pull hard on your rosary with undue force. It would be hard to make make a rosary with any Stainless steel wire thicker than 21 gauge. For Sterling wire, Bronze, or Brass wire the 18 gauge is a very strong choice. It is a thicker through many beads. It is difficult to bend 18 gauge wire for rosaries, because it is so thick. Additionally, such thick wire will not fit through the holes in some beads. For these reasons, 18 gauge is an uncommon gauge for most rosaries. 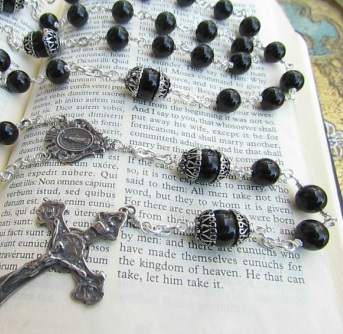 The 20 gauge half hard is a more common choice for the chained rosary. Bronze 20 gauge wire is tougher than Sterling Silver or bronze. But all three are very strong. The 20 gauge solid wire produces an heirloom quality piece. _3. Wire Wrapped Rosaries For these wire wrapped rosaries a thinner wire is used that will fit through the bead and is more easily wrapped around. The most common wire is 21 gauge or thinner. _4.Flexible Jewelers Wire: Another kind of Stainless steel wire is called Flex wire. (flexible wire) This wire is not solid, but is constructed like a rope. The best size of flexible wire to use for for rosary making is 49 strands of stainless steel Choosing 49 strands allows the flexibility and strength that is needed in your piece. These strands of stainless steel are bundled together and wire coated. The Accuflex wire I use is lab tested to 24 lbs of tensile strength. But to maintain that strength, skilled construction on this rosary is a must. I don't like any shifting of the Our Father beads, so I usually crimp on each side of the Our Father bead, just in case. 3) Flexible wire is super strong, but NOT indestructible. Some people really tug on their rosary beads, twist and turn them. The rubbing of gemstone on wire can cause the wire to fray over time. Then the whole rosary must be restrung. 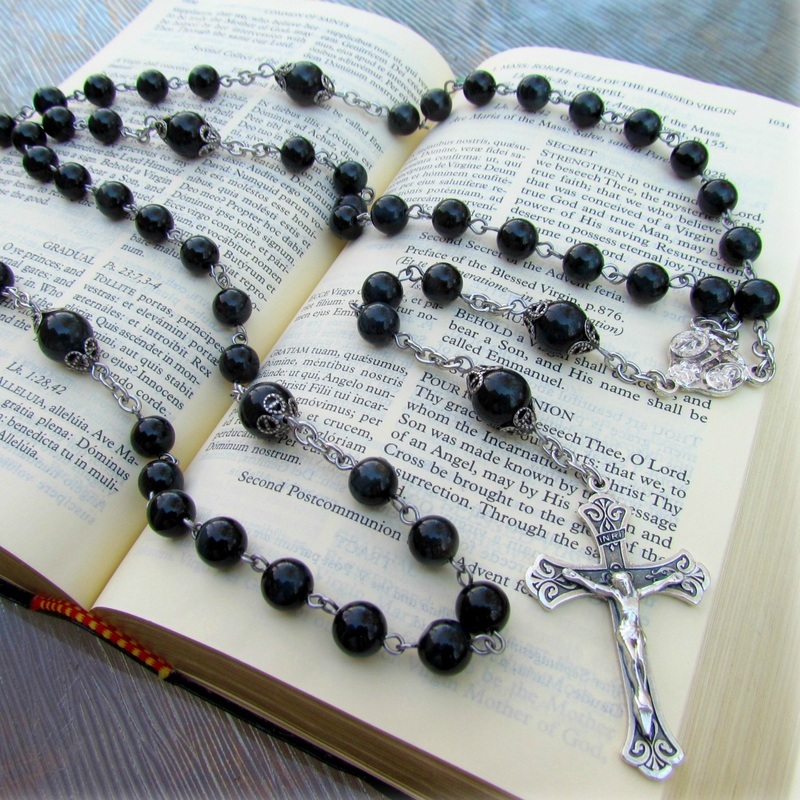 I have found that most people do not experience any problem of fraying with their rosary. My own mother prays her rosary several times a day and after 3 years the rosary is still holding up with very minimal stretching. For the person who is exceptionally hard on their rosary (I have met a few priests in this category) , I recommend the solid wire Chained Rosary construction. Most well-constructed Flexible wire rosaries do not show much change after several years when stored in a rosary pouch and used during daily prayer. As mentioned the cord rosary is very strong. The rosary beads used for this method must have big holes, so wood is the most common choice. The wood and cord rosary is lightweight and fluid. It is the most economical and common choice for a mans pocket rosary. The drawback to the cord rosary is that it can fray in time, and there are limited bead choices, since only wood beads have holes large enough to accommodate the thick cord. A Beaded Rosary is technically any rosary that is strung on Jewelers thread or wire.. Some people use fishing line, Beading thread or Flexible Jewelers wire. I personally would not use anything but Flexible Jewelers wire for a beaded rosary since only Flexible Jewelers wire will have the durability that a rosary needs to have. Note: Accuflex, Beadalon, and Flexwire are brands of Flexible Jewelers Wire. Tigertail is the early form of beading wire with 3 strands or less and is not as strong or flexible. It is not the best choice for a beaded rosary. Wire-wrapped Rosary: The wire-wrapped method of bead construction is rather pretty. It is my favorite method of necklace making for this reason. The wire is usually 21 gauge or smaller. The wire-wrapped rosary has the distinct advantage of not having open loops. Because it is a thinner wire it can be misshapen when pulled very strongly. It is also possible for the thinner wire to break with continual bending over time. The best wire-wrapped rosaries are made with 20 gauge wire. The disadvantage to the wire wrapped rosary is that it tends to kink when you pick it up. A gentle shake will usually cause it to fall straight again. Additionally, these rosaries are quite a bit longer than any other kind of rosary. These are qualities that are worth considering when considering the purchase of a wire-wrapped rosary. Nonetheless, the wire-wrapped rosary is truly beautiful and durable. The chain rosary is so called because each bead is linked together like a chain. This is my personal favorite for an heirloom rosary. These rosaries are made with wire that is hand turned around each bead. The loops are open, but if they are handmade with the strongest wire and closed tightly, they should not pull open. It is an added value to have jump ring that encircle the opening of the loop. The jump rings not only add beautiful but also prevent the loop from opening. Whenever possible it is best to use use soldered chain for these rosaries. When soldered chain is not available, a thick and strong chain is also a great choice. I find that Stainless steel chains and thick brass chain does hold up very well for heirloom quality strength. In my opinion .....The Flexible wire rosary is the winner for cost and beauty. The wood and cord rosary scores best for cost but wood and cord is not as beautiful as gemstones and crystals. The hand wired rosary gets excellent scores for beauty, but the time it takes for construction makes it more costly than other rosaries. The Knotted Cord Rosary wins for economy and strength. It is a great choice for the Mission rosary, or the Military rosary, since it is also a silent rosary. But it is decidedly not so pretty, or valuable as a finished piece. The Solid wired rosaries are the choice for heirloom quality. Precious medals like Gold or Sterling Silver wire with quality gemstones is the choice for a rosary that will only increase in value. A precious metal rosary is an exquisite gift that can be passed onto the next generation. Unfortunately with the cost of precious medals at an all-time high and ever rising, this option is quickly becoming out of reach for the average person. An excellent option for a lasting and beautiful heirloom piece is the Stainless Steel wire, Bronze, or Brass wire construction. This is a mid-range price between the Precious medal rosary and the Flexible wire rosary. This will be more expensive than the flexible wire because of the extra time involved in the construction. But it is still within the budget for many people who want a very special and lasting rosary. Is there an unbreakable rosary? This really is an impossible claim. Most rosaries are made with beads that can be broken if dropped. The flexible wire rosaries and solid wire rosaries will last a lifetime when used under normal prayer use. For the rosary that undergoes a lot of tugging and twisting, the solid wire, chained rosary is my choice. The important thing, is that your rosary maker stand behind their rosary in the event that something unusual should occur. In my opinion each person should own a beautiful rosary according to their means. I believe that a beautiful rosary is a reminder of the importance of prayer. It is similar to the reason we build beautiful churches for God. The beauty that surrounds us is a reflection of Gods beauty. In the Old Testament, we see constant reminders that we are suppose to give our best to God. 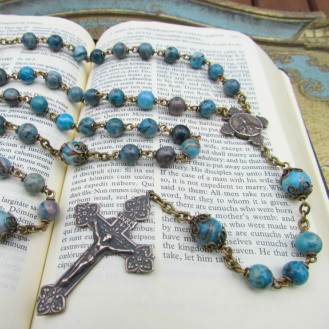 What is most exciting to me is that I have had many customers share with me that since they purchased a beautiful rosary, the piece itself is an inspiration to pray the rosary daily! A final note on Materials: Here are some final thoughts to consider in rosary construction. Remember that the type of wire used in the construction is very important. Some alloys are very weak and will not hold up as well as others. Consider the gauge wire that you will you use...the higher the gauge number, the skinnier the wire. Take your time to wire your rosaries with care. Loops should be uniform and wire should have have no nicks. Consider the quality of your rosary parts. If you choose plated metal they will wear thin over time and will not stand up to being polished. What kind of beads were will you choose for construction? There are so many beautiful beads to choose from. When purchasing gemstones, choose reputable sources to be sure the quality reflects the price. Please visit my Graceful Rosaries shop to view my hand made rosaries made with quality materials and super strong construction. Please, feel free to ask any further questions you may have. Do Not use this page without permission. Information on this site copyrighted by Graceful Rosaries.